If you know me by now, wine and I are more than just friends. So, when you live within 3 hours’ drive from Paris to Burgundy, the Galettes des Rois have been baked, tried and tested, and good friends ask you to join them for the annual wine festival, what would you do? So I missed Burn’s Night again this weekend for this. 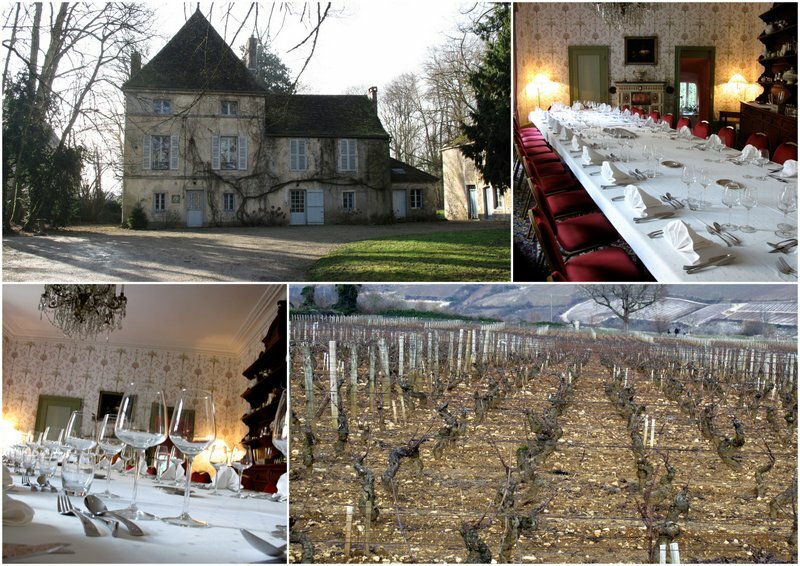 According to the New York Times, Burgundy is one of the top 15 destinations to travel to in 2015. I say Burgundy, but let’s say Bourgogne, darlings. 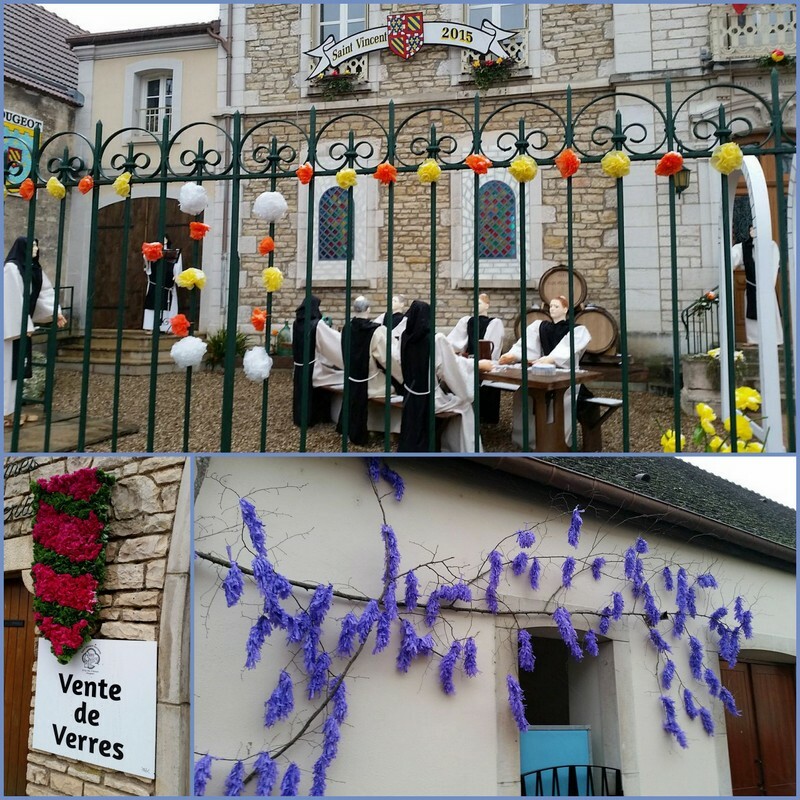 If you follow the blog, you’ll remember about the Fête de Saint-Vincent Tournante in Saint Aubin last year – so I’ll not repeat about the festival’s history and background. 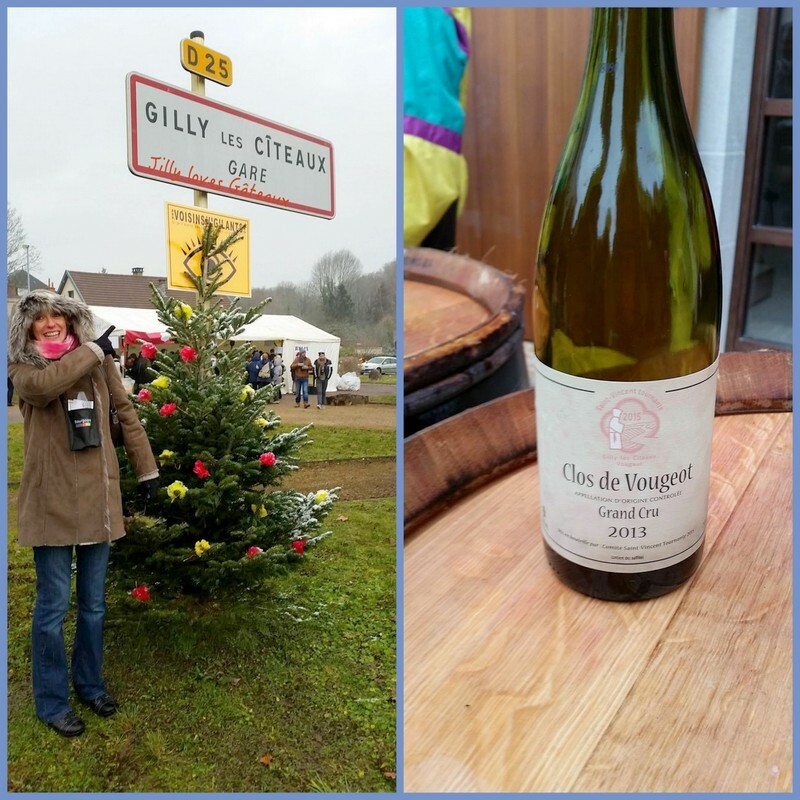 This year the 71st wine festival took place in two tiny villages of the Côte de Nuits: Vougeot and Gilly-lès-Cîteaux between Dijon and Beaune. Before the Fête started on Saturday, we kicked off the weekend for dinner. Last to arrive at the Château Tailly (that’s what happens when you leave at 4.30pm from Paris – it takes an extra hour just to drive out of it!) our lovely friends thankfully saved some Crémant de Bourgogne apéritif and we quickly dumped our bags in the Hemingway room. 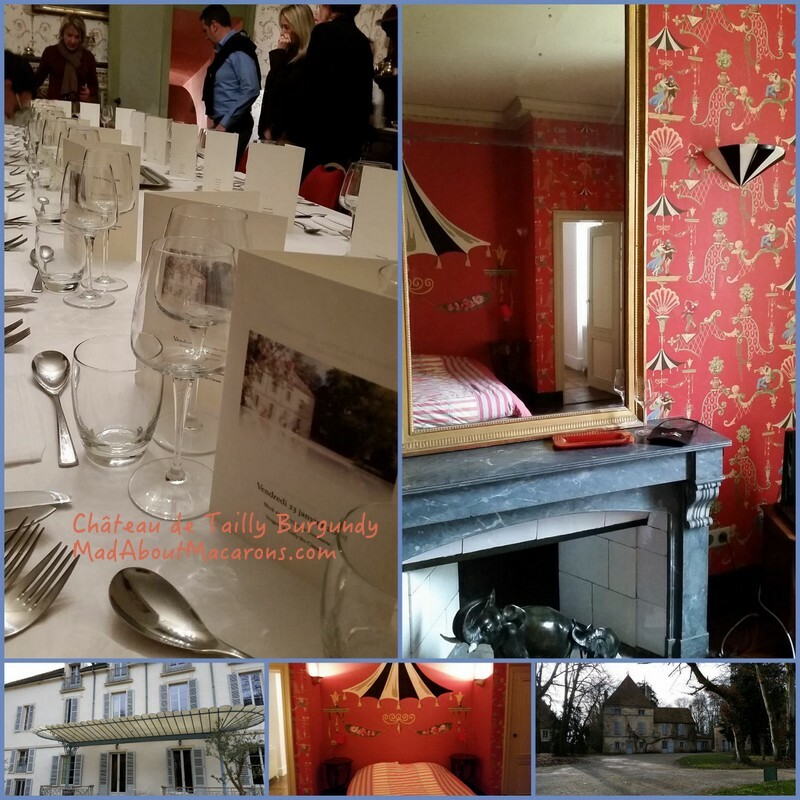 Oh, to drop everything and live like a lord and lady for the weekend… Château Tailly is a Gîte de France (details on previous blog post) and a wonderful, welcoming place to stay in Bourgogne. Like last year, our weekend was organised by our good friend, Hervé, who is Master of Organisation Extraordinaire and thrives on it. Toma Le Courbe, our talented chef, prepared a meal around a lobster theme: starting with a lobster claw risotto to accompany a Rully 1er Cru. This was toe-curling! I am definitely adding more sauce from now on to my risottos. His secret? A dash of Cognac, tarragon and nigella seeds. 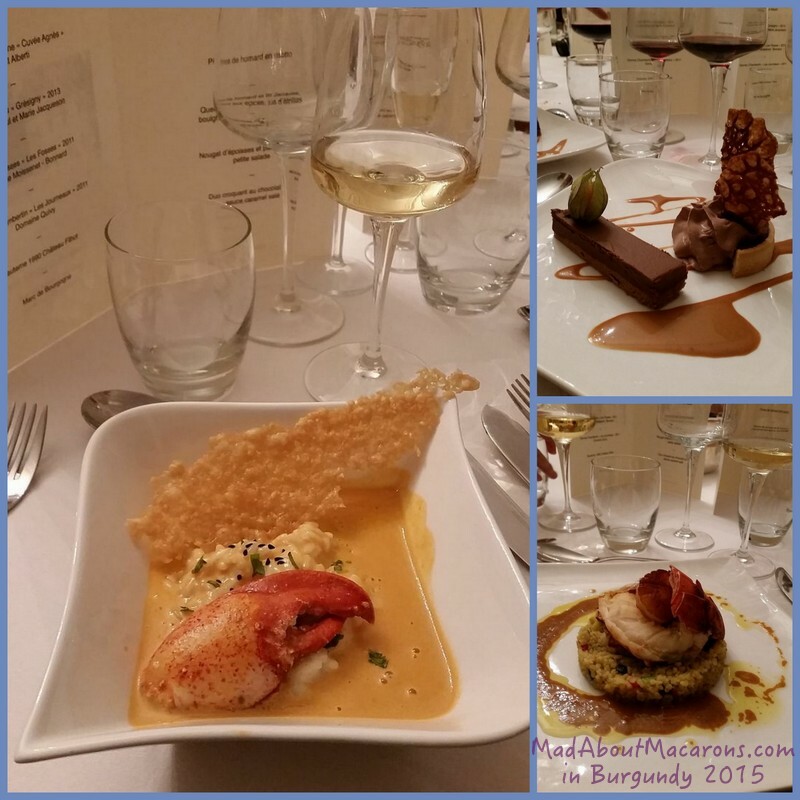 Main course was lobster tail and scallop with lightly spiced bulgur and a velvet crab (étrilles) sauce. The best wine with this was Jean-Pierre Guyon’s Nuits Saint-Georges white (pinot blanc) – a rare occasion to enjoy this, as it’s normally a red wine. The cheese course was a typical speciality of Burgundy – more on this with a recipe to come soon. Next morning the Ceremony officially started at 6.30am – Chefs Toma and Marie were already bravely serving for the festival. As the procession took place amongst the winemakers and the red-golden-robed Chevaliers de Tastevin, we visited our high profile but down-to-earth winemaker friend, Jean-Pierre Guyon. 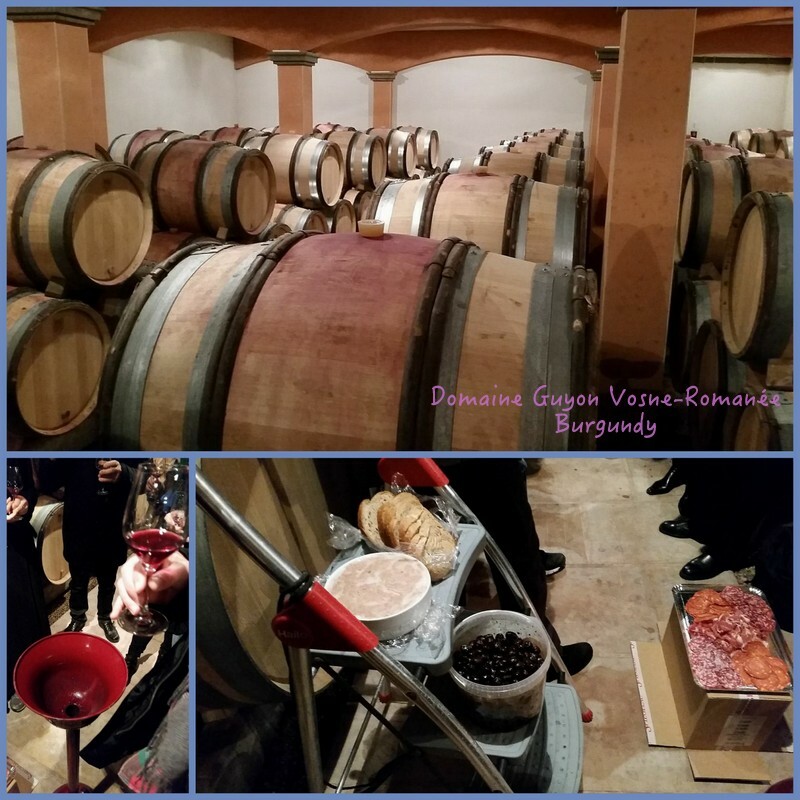 He took us through his legendary wine tastings directly from the cellar in Vosne-Romanée. 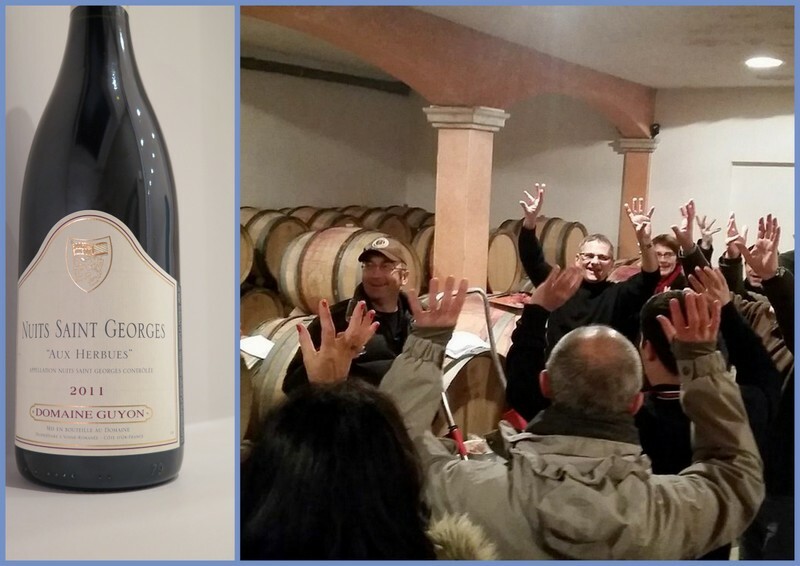 It’s not that his winery is on the national road (la route des Grands Crus – D974) and only 20 minutes walk to Vougeot, but Domaine Guyot’s wines happen to be some of the best and purest of nectars in Burgundy. 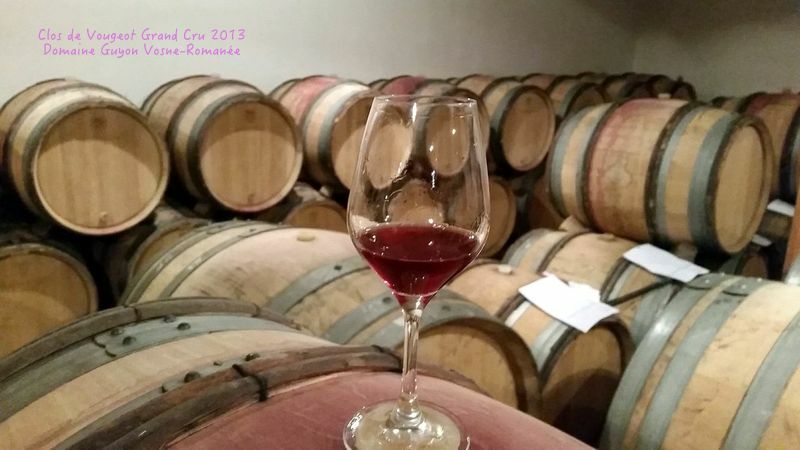 Starting from the basic of Bourgogne reds, through to other Grand Crus such as Gevrey Chambertin, we finished off with the festival’s stars, the Clos de Vougeot and Echezeaux 2013 – still in barrels and not yet ready but boy, the flavours! If it was a blind tasting, I was convinced I was drinking a white Mersault rather than a red Clos de Vougeot (although Mersault is not that far away from here.) The flavours of cream and soft vanilla opened up in the mouth 10 seconds later – and that was only 2013! Top of the ladder’s lunch was the most exquisite rillettes pâté. Needless to say, I used the spittoon if I wanted to get through the day! Although a couple of Grand Crus ‘accidentally’ slipped down – how on earth can you spit that out? Finishing with hands in the air with the traditional Ban Bourguignon song to thank Jean-Pierre, it was time to walk to the Fête de Saint-Vincent Tournante. Luckily I was wearing long-johns and extra thermal gloves since it was absolutely freezing! The vines dusted with snow sprinkles, take a look at the rich soil or terroir. With 100 appellations in Bourgogne, the Côte de Nuits has 13 Grands Crus appellations. For this event, the Grand Crus stars were both Clos de Vougeot and Echezeaux. What’s so incredible about the wines here is that the terroir is so different in one area to the next so, even although one appellation can be near to the other, the tastes of the wines can be so varied. The history of wines here stretches back 900 years when the monks constructed buildings around the vineyards. 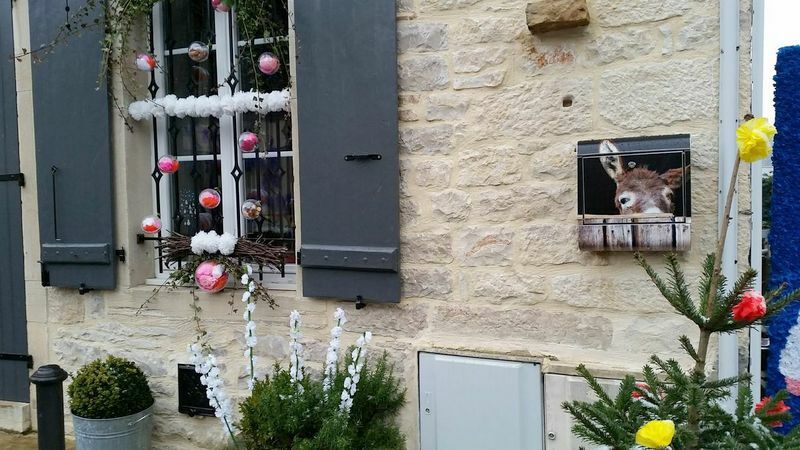 It takes the villagers weeks to voluntarily prepare for the event, decorating buildings with paper maché flowers. This year I just bought one sampling pack (well, I’d lost Antoine! ): 15€ for 7 tasting tickets, a special St Vincent 2015 glass and map. The French postman? Eewah, eewah, ee-always loves dropping in some letters! 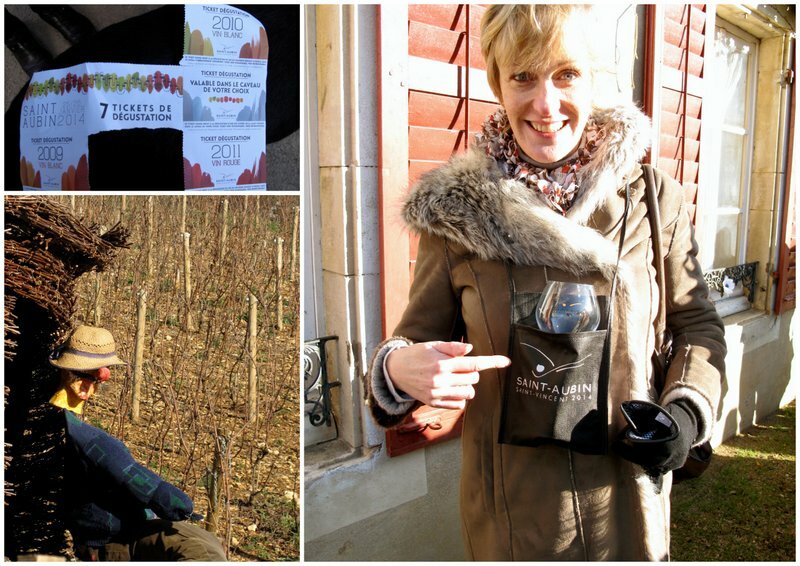 The glass comes in a special pochette that hangs around the neck, so you can wander about the villages without needing your glass in hand. Just as well, as I could no longer feel my fingers! In the end, I only tasted 2 wines: the ordinary Bourgogne and one of the two Grand Cru stars, Clos de Vougeot. Poured into a chilled glass, fighting off the snow flakes, it wasn’t just that it was over chilled: we were spoilt by tasting Jean-Pierre’s wines beforehand. So, I just circulated to enjoy the ambience. 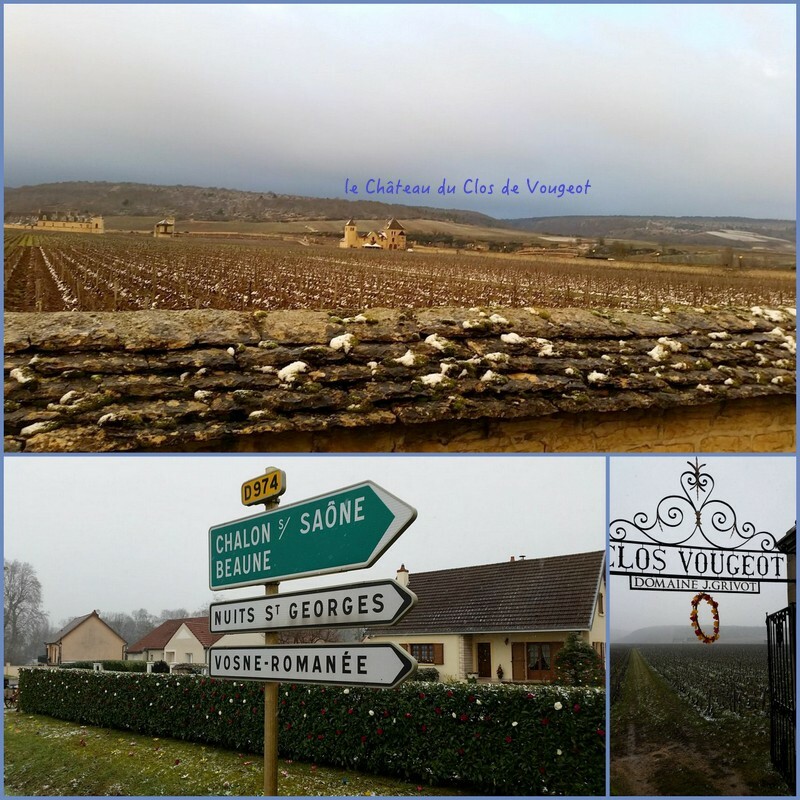 The village of Vougeot is particularly picturesque: I’m returning in the summer to appreciate visiting the Château du Clos Vougeot and the neighbouring wineries. 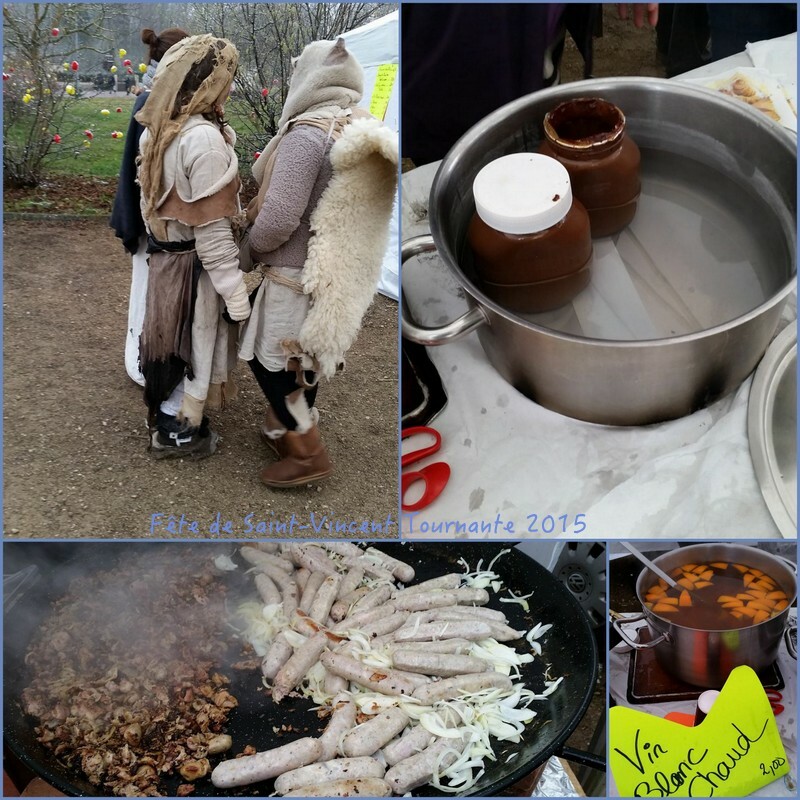 Andouillette sausages – and Nutella?? Toma and Marie’s stand were attracting some funny-dressed crowds, as the smell of Andouillette sausages were swirling around his tent. I cannot for the life of me even try it. The “fragrance” is rather overwhelming. The French mock me, saying it’s the same as our Scottish Haggis. It’s not the same thing. So roasted chestnuts were my preferred afternoon goûter or 4 o’clock treat. 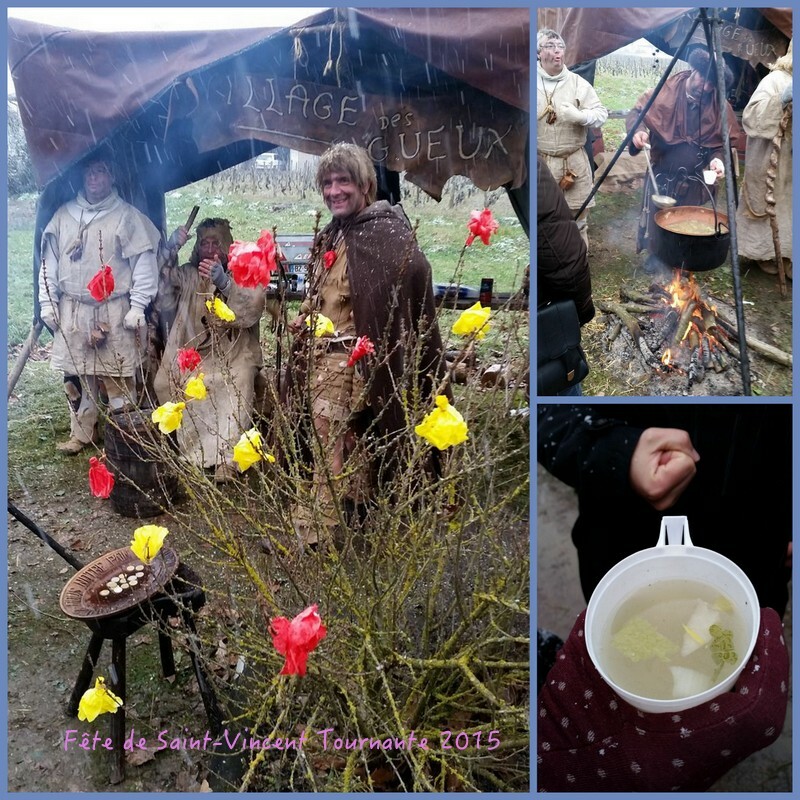 Then I stumbled on something, a snow storm took off and stepped back in time – to the Village des Gueux (desgueux means disgusting in French). I was Asterix in Bourgogne. Soup, anyone? The soup was welcoming to warm frozen fingers. Let’s say that was about it. Motivation was strong during the long walk back in the biting winds to the mini-bus, as Toma and Marie had already left their stand and taken off to their new restaurant in Rully to prepare dinner. Back to civilisation, after a hot bath to defrost. 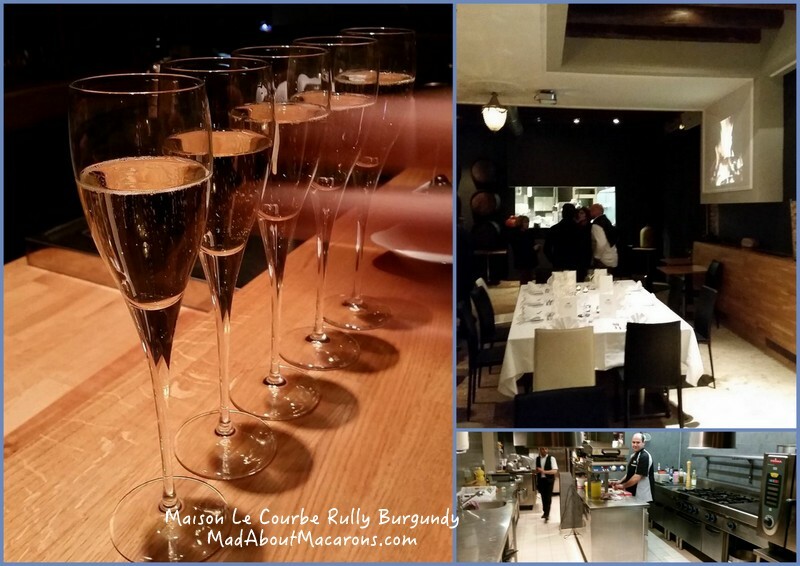 I strongly recommend Toma and Marie’s new restaurant at the Maison Le Courbe in Rully. The courtyard is wonderful (sorry, my photos were too poor in the dark) and suggest you enjoy the view to the château in Rully in the summer, when the weather is more clement. 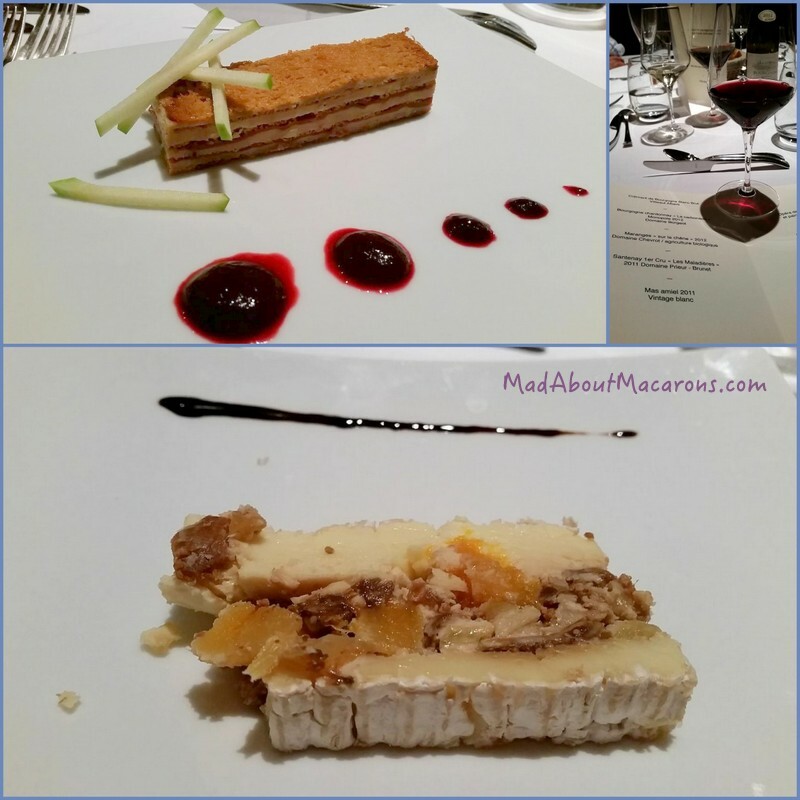 Toma’s culinary skills showed off with his entrée of an Opéra of Foie Gras, smoked duck, pain d’épices and a blackcurrant coulis. Chicken was stuffed with snails (yes, I eat these too! Not bad for an ex-vegetarian!) in a creamy garlic sauce. Cheese? I must write about this separately! To finish off was a Paris Brest – a Parisian speciality, of which the recipe is in my book, Teatime in Paris. 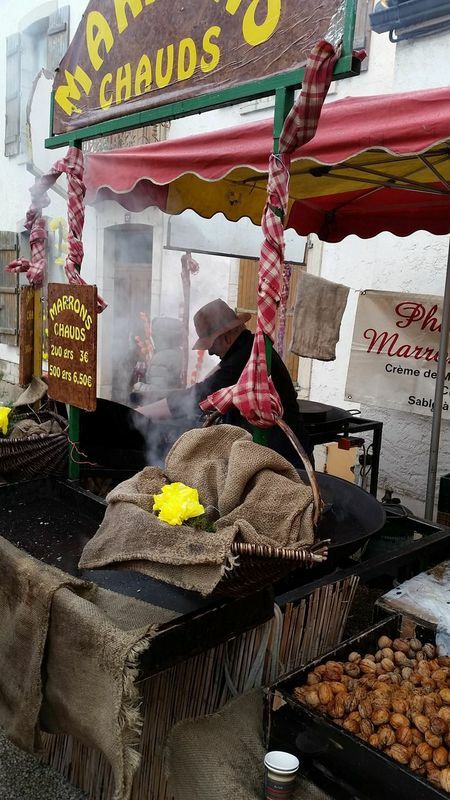 For the latest details on this year’s Burgundy wine festival (always end January), then consult the official Fête de Saint Vincent Tournante website. I should have split this long post up into episodes. 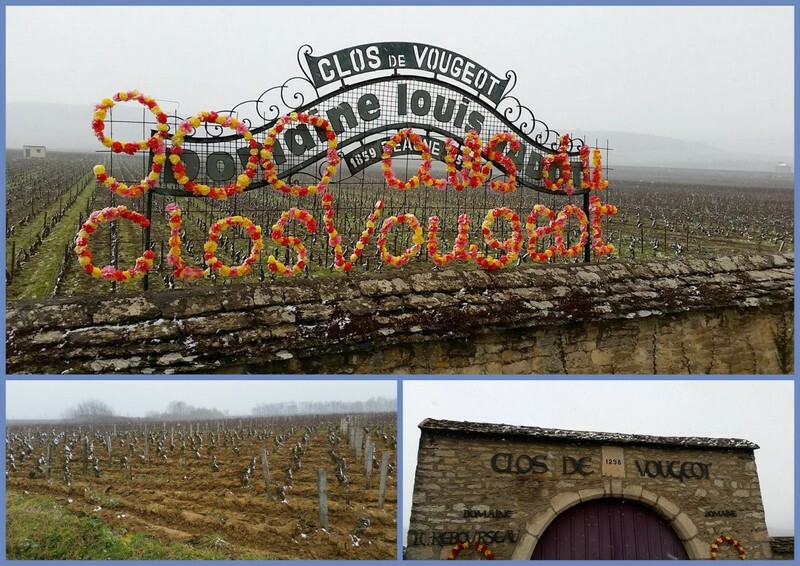 Instead let me share with you a bumper wine edition from Burgundy’s annual wine festival which took place in Clos Vougeot. 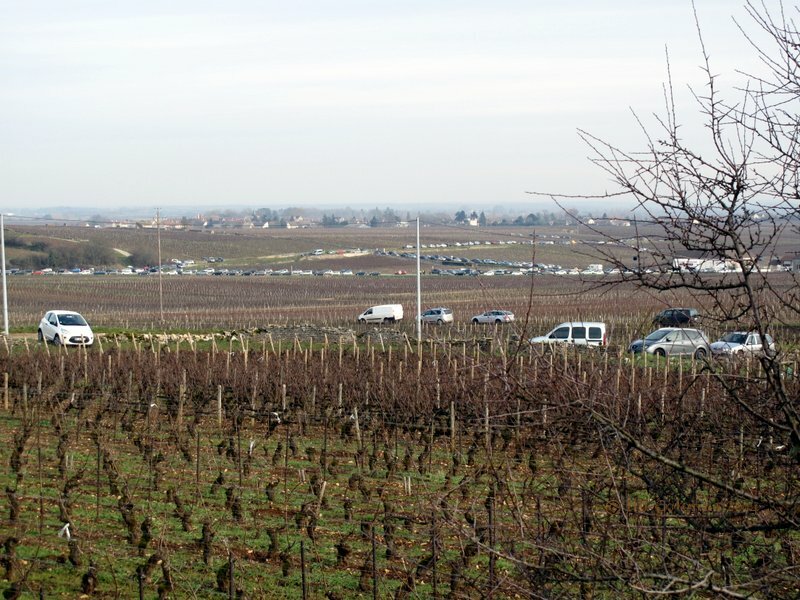 This past weekend the vineyards around Burgundy’s Côte d’Or were alive with the sound of visitors trying desperately to park their cars. 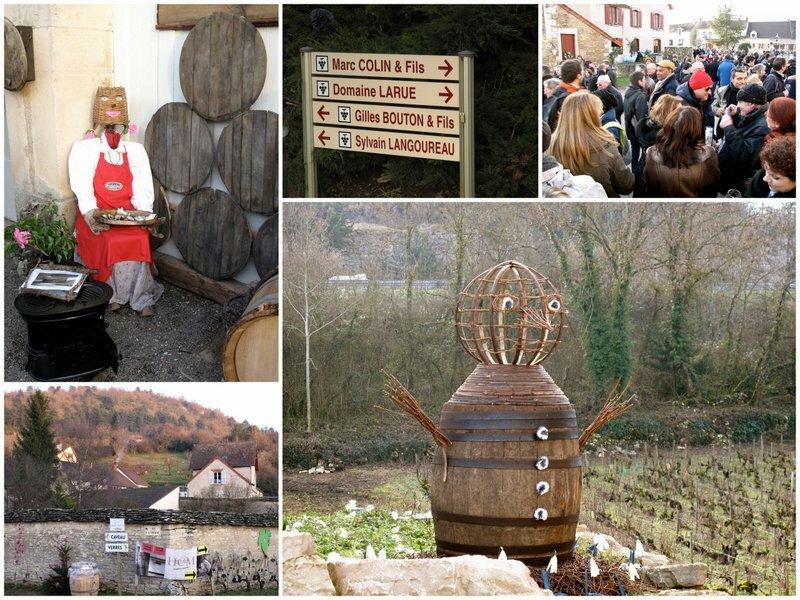 Nearly 50,000 visitors turned up to the 70th edition of the Festival of Saint-Vincent Tournante in Burgundy this weekend, over 25-26 January. 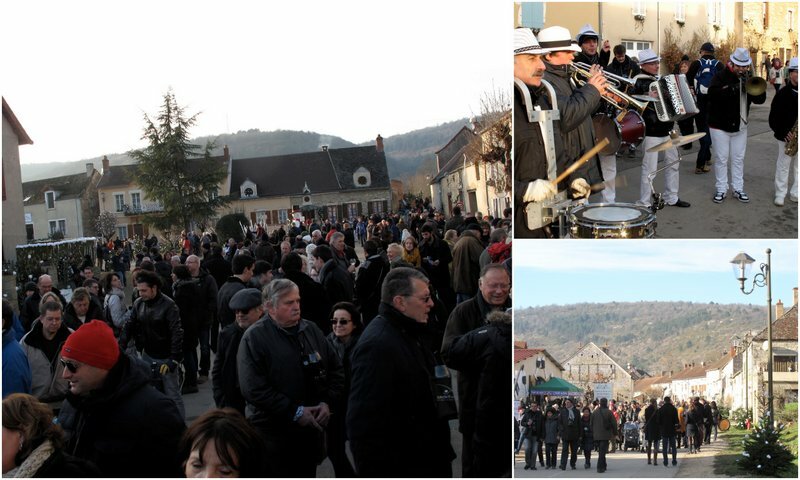 It’s the first time the wine festival was held in the tiny village of St Aubin (with 260 habitants) in the Côte de Beaune. 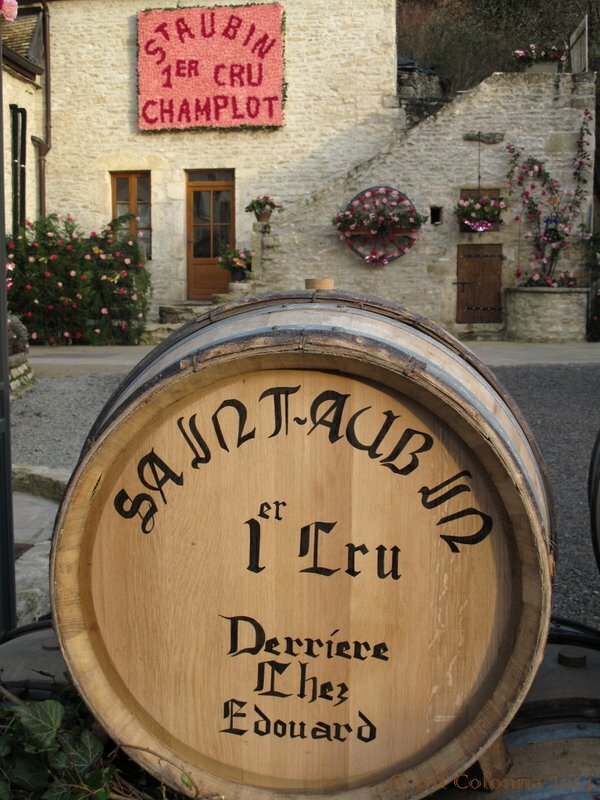 Traditionally celebrated over 2 days in January, each year the wine growers around Burgundy get together to pay homage to their patron saint, St Vincent. It’s a festival that originated in 1938 but not until 1964 was it opened up to the public and, ever since, each year it has become increasingly popular. It’s as if we’re stepping back in time. Early morning at sunrise – following a glass of the white nectar with breakfast – there is the traditional red and golden robed procession of the Confréries des Chevaliers du Tastevin with the wine growers (vignerons) through the chosen village, followed by a religious ceremony – all under the protection of Saint Vincent, held high above the vignerons’ shoulders, represented as statues amongst the various wine growers’ banners. 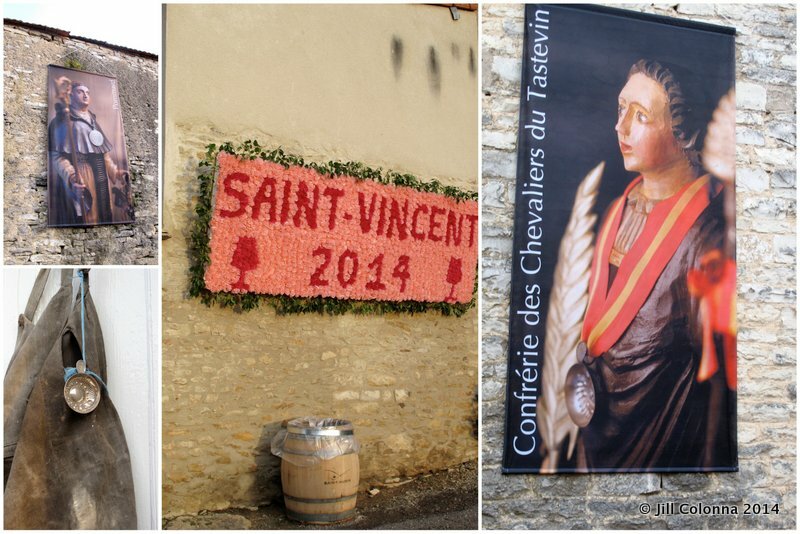 We witnessed the St-Vincent procession four years ago in the neighbouring host village of Chassagne-Montrachet. I’ve hunted for my photos from the ceremony in vain, but for images of the religious procession in St Aubin, click here. 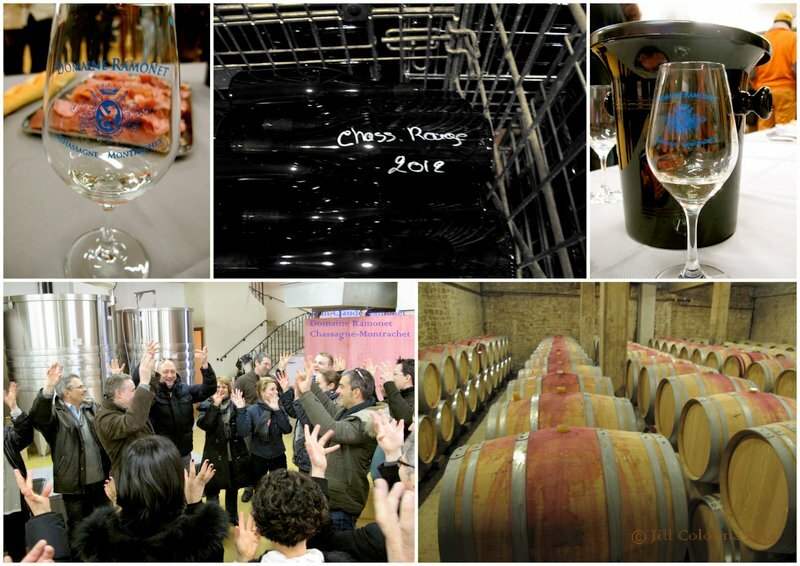 We missed the ceremony this year, as an invitation to a tasting of Jean-Claude Ramonet’s legendary Chardonnay whites in Chassagne-Montrachet was one of these you-only-live-once opportunities. The only wine bottles we saw were ones without labels, replaced with white abbreviated markings of type and year, not yet ready for the public. Starting with Bourgogne Aligoté (the dry, even tart wine that traditionally is used in the kir apéritif), we went through young wines such as Le Montrachet (I took me years to realise not to pronounce the ‘t’) and concluded this exceptional white tasting with a monumental Bâtard-Montrachet. 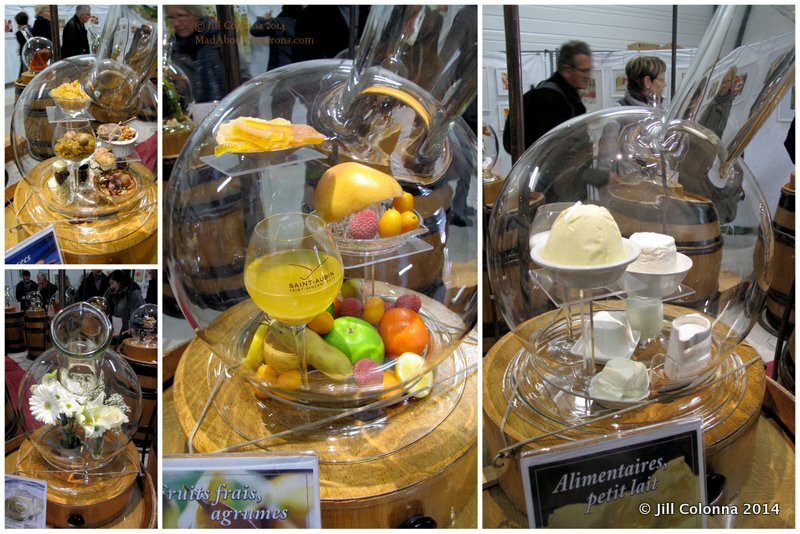 The sophisticated aromas were either already full of butter and dried fruits or slightly closed, like under-ripe peaches. What’s astonishing is that a couple of minutes later after tasting, the most immense flavours of buttered toast, nuts, cream and peachy fruits start dancing in the mouth. With these kinds of wines, you don’t use the spittoon. Having my modestly petit wine diploma from the Wine and Spirit Education Trust a hundred years ago (the first that takes you on to the ultimate Master of Wine), it gave me a lame excuse to swirl the golden drink of the wine gods around the tasting glass. 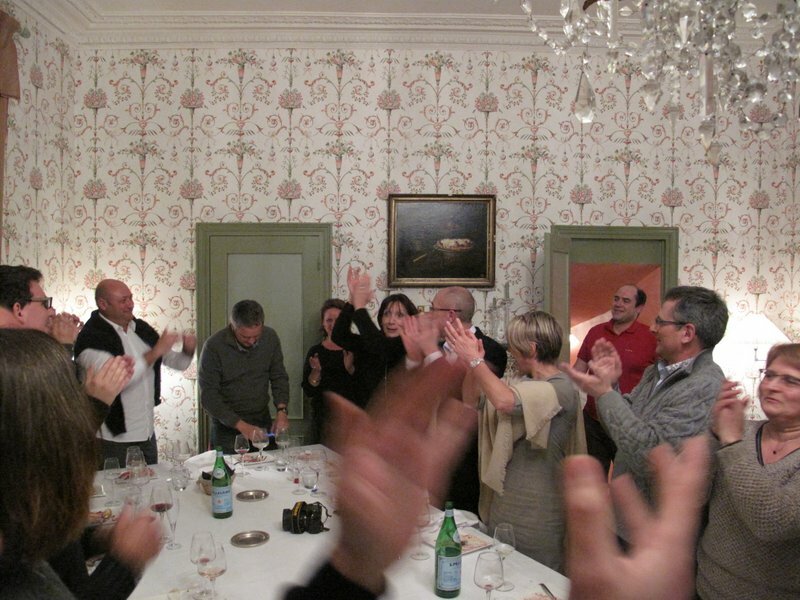 What I hadn’t learned in my student days was the traditional hand-twirling, clapping song, le ban Bourguignon: lala, lala, lalalalalèèère, lalala, lalala, la, la, la – a signature appreciation to end off the event. Next stop, St Aubin. As you can see from the dazzling sun bouncing off my huge frozen nose (now developed into a lovely sinusitis, or is it turning into a French nose? ), St Vincent also protected us with the weather. It may have been just above zero degrees but the sun made up for the numb fingers and toes. 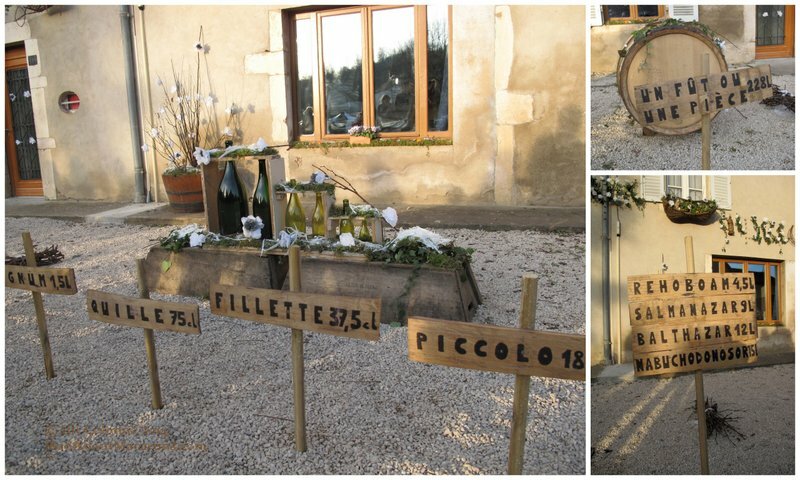 For the festival, 6 wines (cuvées) were made especially for the occasion with a 7th ticket for the day used as a glass of your chosen wine-maker. Glasses sporting Saint-Aubin logos are THE designer glasses that you’ll need for the weekend; apparently the glass idea started in 1973. 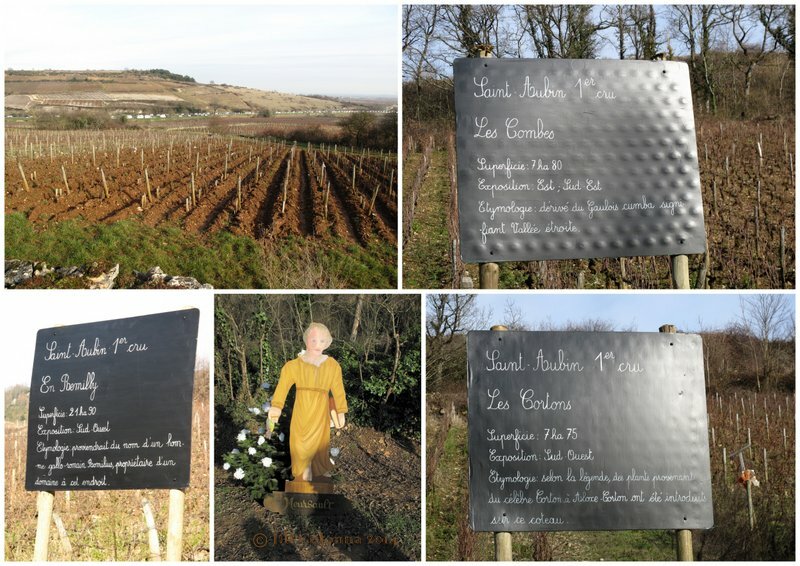 There are 130 hectares with 30 Premiers Crus in St Aubin, with reminders throughout the village. 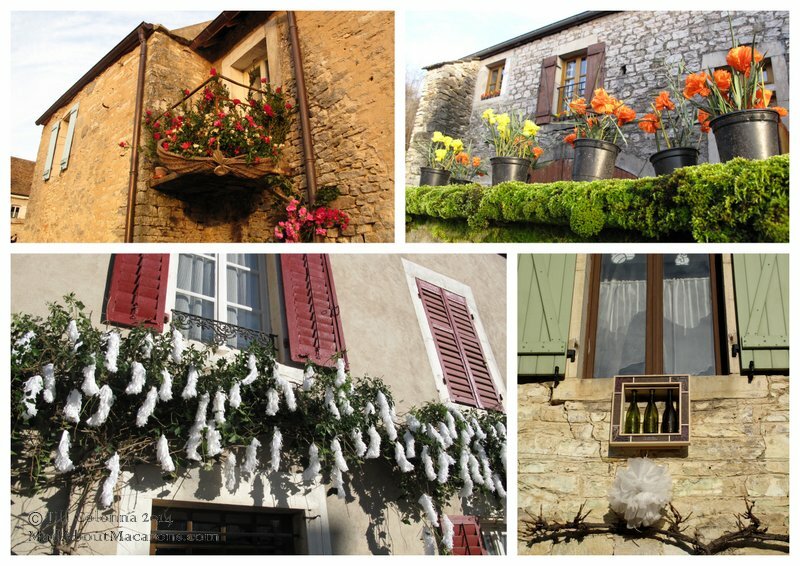 Every house and balcony are decorated by the village residents with realistic-looking flowers, made from colourful crepe paper. We were so wrapped up with the convivial atmosphere, with musicians and eating stands (my idea of the perfect lunch was a bowl of oeufs de meurette, not pretty to photograph but exquisite poached eggs oozing in a red wine, garlic and bacon sauce mopped up by a crusty baguette), that it was quite easy to forget about the wine tastings themselves! I ended up tasting only 2 whites but then, after Ramonet’s exquisite wines, it’s no surprise. 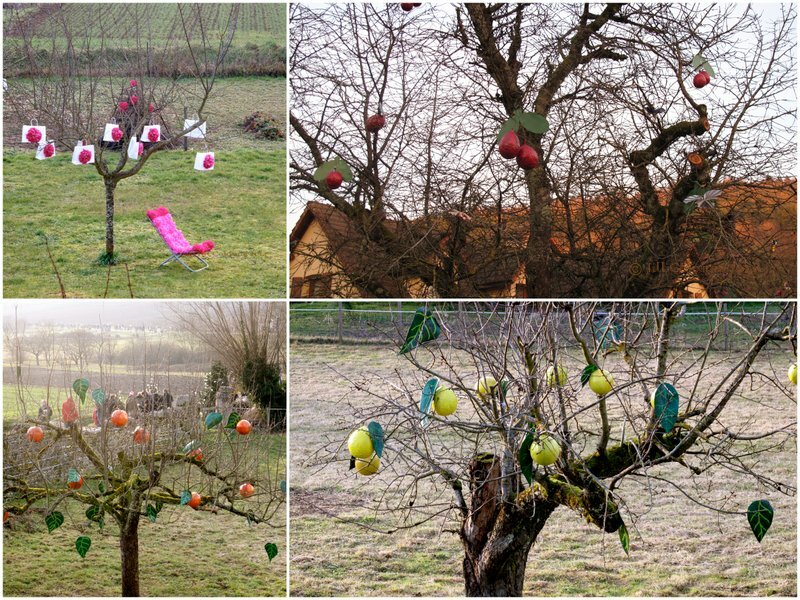 The village is traditionally decorated according to the four seasons. Spot the tree humour and crêpe paper effects on this summery deck-chair. Do you know your Magnum (1.5l) from your Rehoboam (4.5l) or Balthazar (12l)? Perhaps useful to have up your sleeve if you’re playing ‘Who Wants to be a Millionnaire’? This is when I got lost from our group members by taking photos.Suddenly there were a few people wearing red hats like our friend, Hervé. I just happened to follow the wrong one. 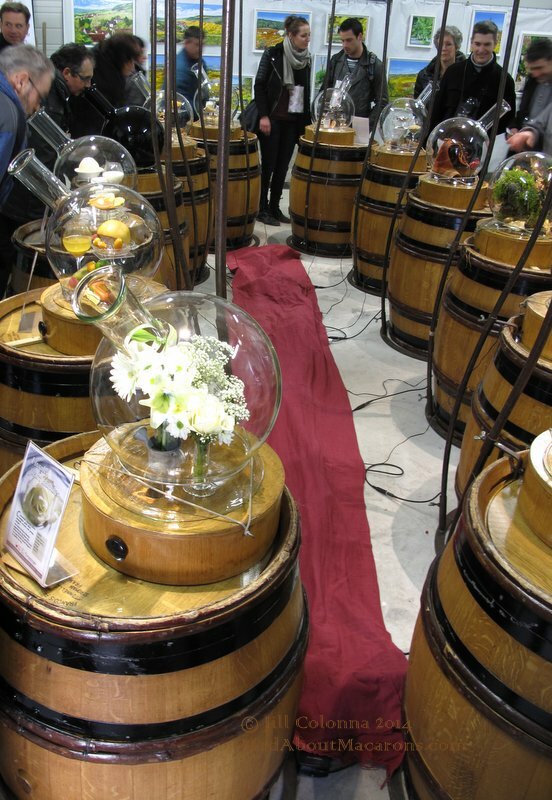 Hot oysters this way, red wine tasting that way, or what about this way for a wine aroma experience? Stick your nose in there. Do you get white flowers, fresh fruits, citrus, butter or cream? What about dried fruits and nuts? 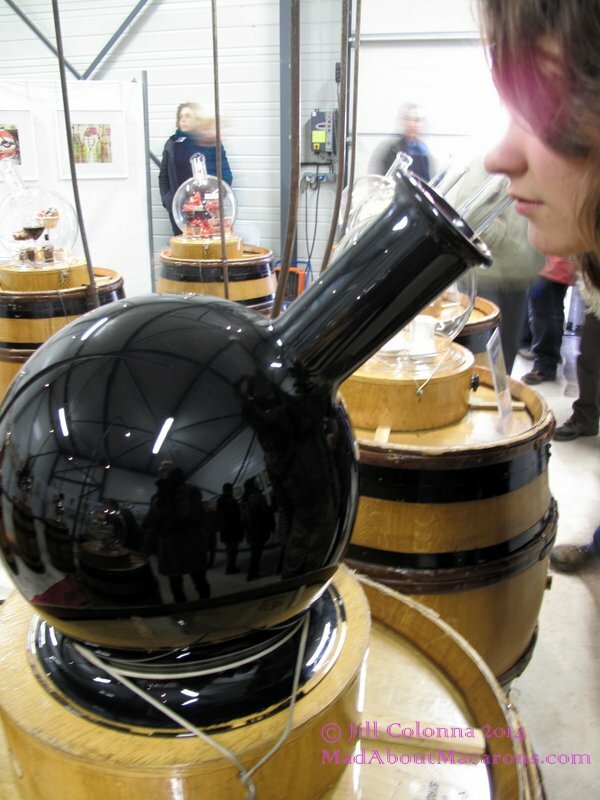 Each aroma family is more powerful than meets the eye. One of my favourite wine games is blind tasting using black glasses (sometimes you can get caught out with water!) but this was a blind aroma test. We all debated but I’m sure this one was honey. Time to move on, as it’s a sticky subject. 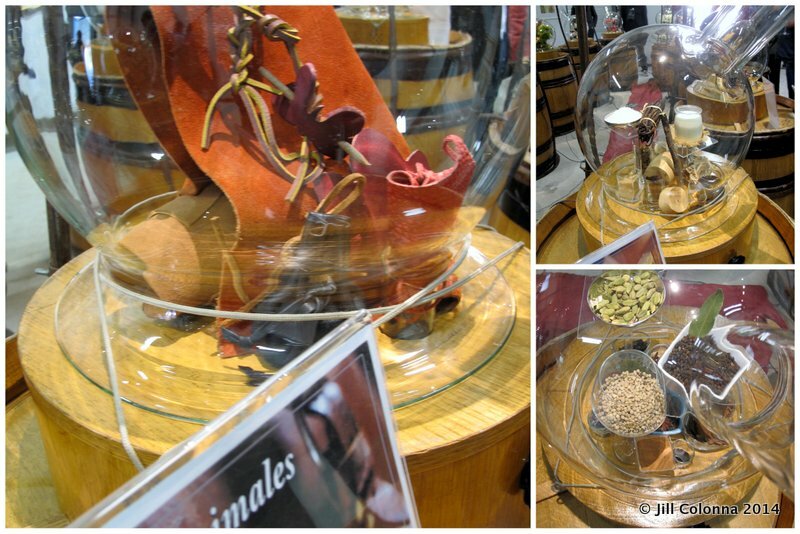 For red wines in particular, perhaps you discover the animal side: do you get the leather aromas, or wooded vanillas and spices such as cardamom, pepper or coriander? 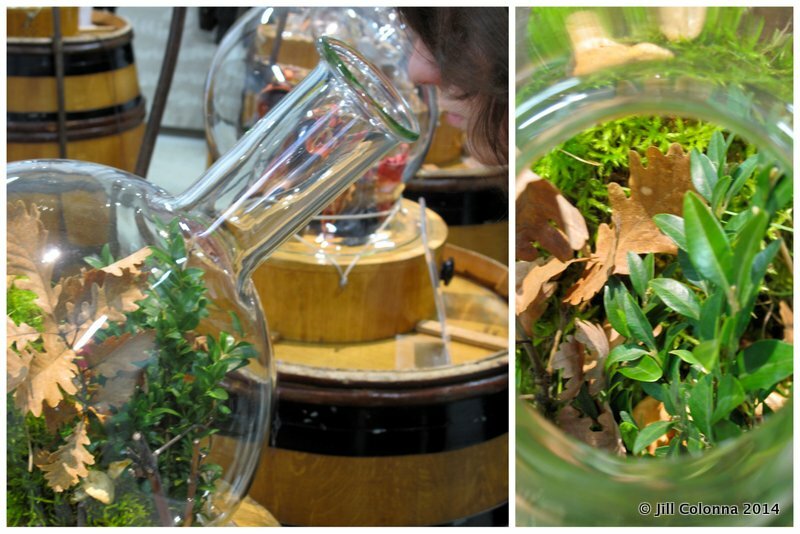 My daughter, Julie, pushed the button on the sous-bois jar. How many times have you had an earthy red wine, recognising the natural wafts of the leafy, moussy undergrowth? It was so realistic. Now, repeat after me, ‘Empyreumatic‘. Fancy, eh? 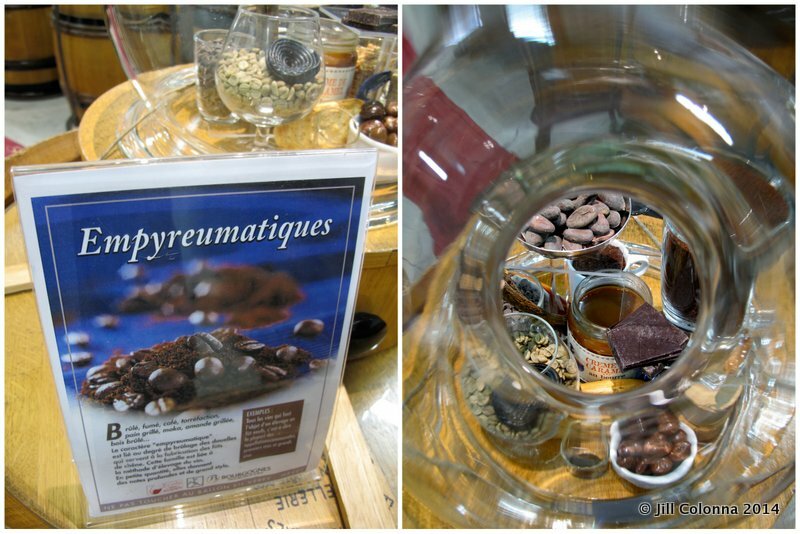 This is a family of aromas that cover anything burnt, smoked or grilled, which includes coffee and chocolate. It’s a sign that wines were aged in wooden barrels rather than just inbox cylinders. Do you get that toast, reminiscent of a white Burgundy, like Mersault? Hm. Try and pronounce that at a wine tasting. 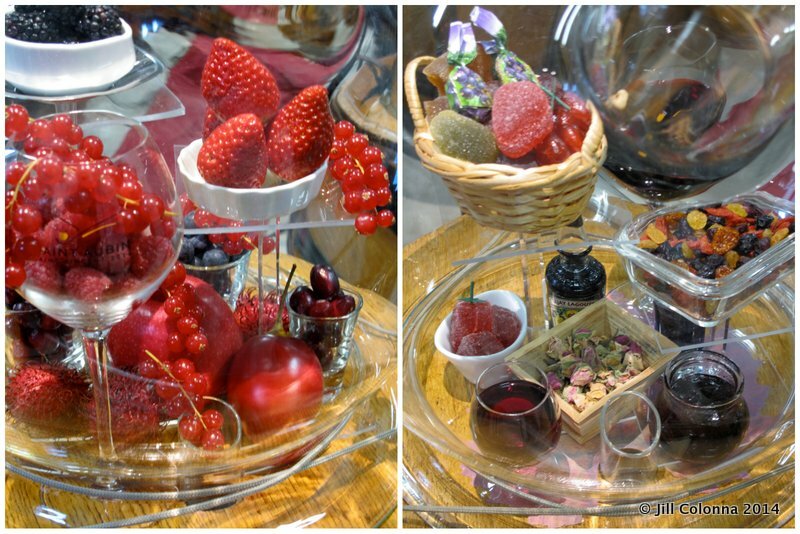 The red fruits and candied fruits were definitely to be sniffed at. Again; and again; and again. Who feels a lightly toasted strawberry gratin coming on? Before night was upon us already, we headed back to our gîte at the Pavillon de Chasse, or hunting lodge. 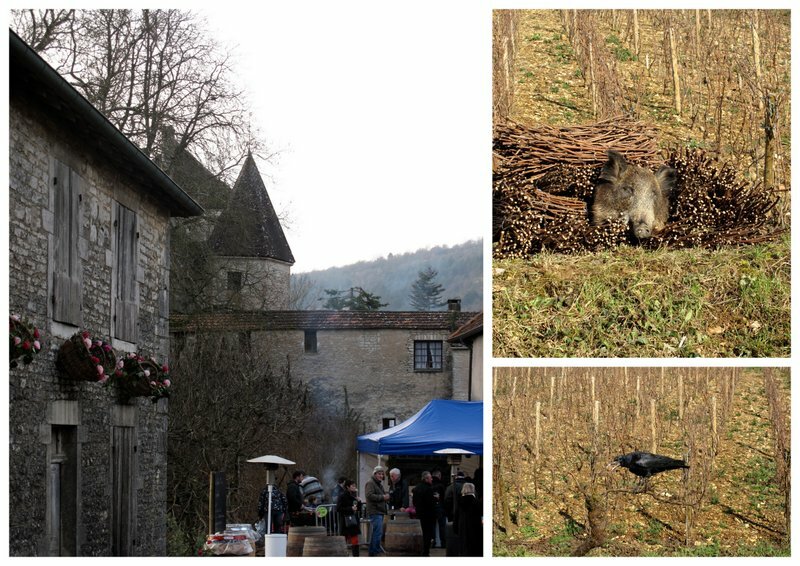 The only hunting we were doing was checking out the rest of our wine friends next door at the Château de Tailly, where dinner was laid on by our chef à domicile friend, Thomas Le Courbe aka Toma, who has worked with chefs including Pierre Gagnaire. The glasses on the table were preparing themselves to be thrilled with our friend, Jean-Pierre Guyon‘s nectar for the evening. Another legendary wine-maker in Vosne Romanée – covering the Côte de Nuits and Côte de Beaune – he took us through his delicate feminine wines from whites such as Savigny-les-Beaune, Nuits-Saint-Georges (pinot blanc) to the purest reds such as Chorey-les-Beaune, Gevrey Chambertain and Vosne Romanée Premier Cru. All tasting samples, you understand. By the end of it all, who could forget the customary appreciation of such an epicurean weekend by singing le Ban Bourguignon? My Cod, it was wonderful, Jean-Claude Ramonet, Jean-Pierre Guyon and Toma. With special thanks to our good friend, Hervé, the prince of organisation! I give you vin sur vin (20/20). Just next time, please don’t wear a red hat. 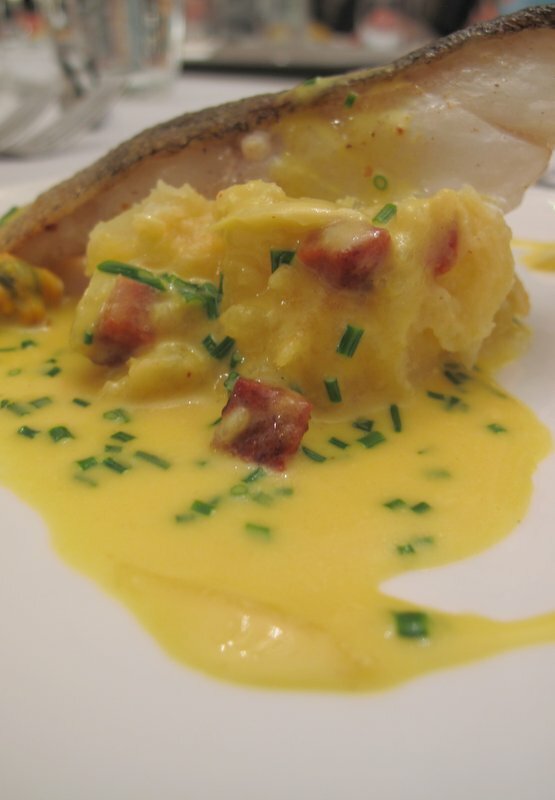 Before I ask you to sing it and wave your hands in the air, what kind of wine would you prefer to go with this cod dish? It has a touch of chorizo, saffron, butter, potato, mussels? I’d thoroughly recommend where we stayed. It’s a 3 hour drive from Paris, 1h30 from Lyon and 35 minutes from Dijon. For more information, contact info@chateaudetailly.com.